I’m in love with Listen Notes, aÂ new-ish podcast search tool. Listen Notes makes is so easy to find just the right podcast content for whatever you’re interested in.Â It currently indexes over 430,000 podcasts and over 26 million individual episodes. Searching:Â Â What I like best is that it a search digs deep and pulls up both podcast series and individual episodes. A recent search on the phrase “winter gardening” found no podcast focused solely on that topic (not too surprising!). But it did unearth 77 episodes with that phrase.Â A treasure trove of content and advice for this newbie winter gardener. Use the More Filters link to narrow your search by topical categories, language, duration, and limit your search to title, author or description. Uses for Educators & Librarians: An educator in one of my workshops was looking for content on polar bears for a class project. A quick search of Listen Notes found a bunch of episodes from some great podcasts that she could consider using. Students doing research projects will find this helpful. Library customers looking for very specific content, or just something new to listen to, will find this a rich resource. 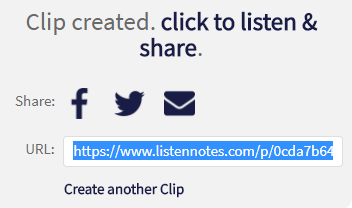 Creating Clips: The option to create short clips from a podcast is so handy for class projects. No more fussing about trying to find the exact starting point for the bit you want to play. 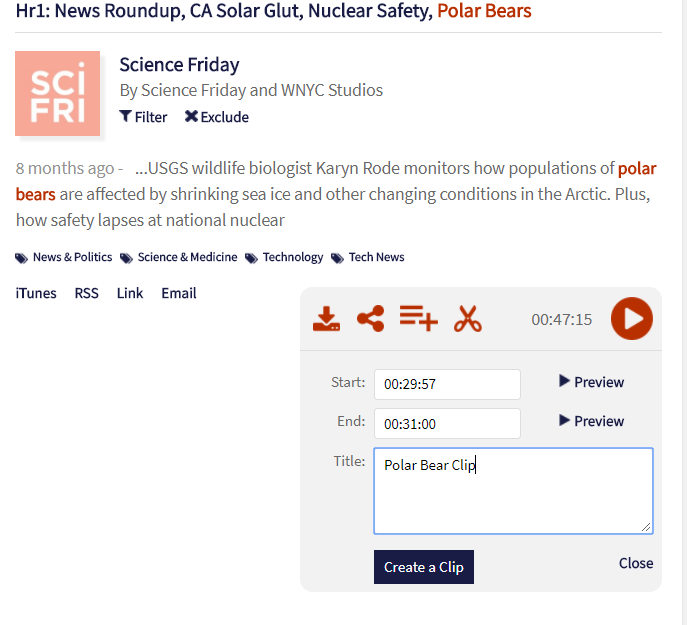 For example, thatÂ story about polar bears starts about 30 minutes into a Science Friday podcast. Listen and note the start and stop time for the story.Â Enter times in the clip editing box and click Create a Clip. There’s even a Preview button to fine tune your timing. Listen Later and Add to iTunes:Â Click the Listen Later option toÂ create a list of selected episodes. Listen Later automatically creates an RSS feed for all your saved episodes. Go to your Listen Late page to find the RSS feed URL, copy it and add it to your favorite podcatcher software. Your episodes will show up in podcatcher. Add more episodes to your Listen Later list and they’ll show up in your podcatcher too. Other options include downloading episodes, sharing via social media, embedding episodes on other websites and listening to the podcast right from Listen Notes. Next Next post: Summer Learning PD Bingo!